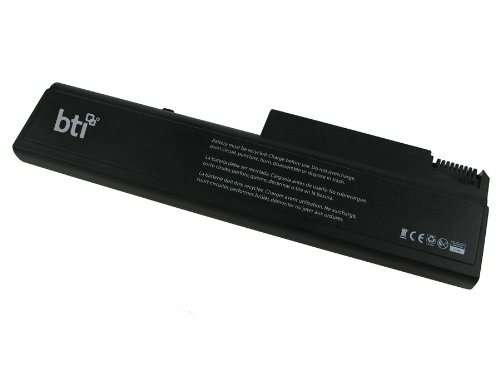 The BTI HPCQEB8440PX6C is a cost-effective and safe replacement battery for your HP Compaq Elitebook laptop. This replacement battery is designed and manufactured with the highest quality standards and guaranteed to meet or exceed the original manufacturer’s OEM (Original Equipment Manufacturer) specifications for part numbers KU531AA, 463310-542, 463310-544, 463310-763, 484786-001, 486296-001, 491173-542, HSTNN-UB69 and HSTNN-UB85. The HPCQEB8440PX6C is a 6-cell, 5200mAh (milliampere-hour) Lithium-Ion battery that provides 10.8-volts of power for optimal performance and has a black finish. BTI uses state of the art charging and cycling equipment, so your battery is guaranteed to have been 100-percent fully tested and calibrated to meet and exceed all standards prior to shipping. The HPCQEB8440PX6C is compatible with the HP Compaq Elitebook models 6930p, 8440p, 6530b, 6535b, 6730b and 6735b. The BTI HPCQEB8440PX6C 10.8-Volt Lithium-Ion Replacement Laptop Battery comes with a 12-month warranty. While under warranty, if a BTI product failure damages a connected electronic device – BTI will replace it. Since 1992, Battery Technology Incorporated (BTI) has become the global supplier for replacement batteries and ac adapters for notebook computers, digital cameras, PDAs, smartphones, APC UPS systems. All batteries are manufactured in “BTI owned” ISO9001 certified production facilities, and delivered against stringent quality standards.